Riding a tidal wave of excitement, the Dominican Republic returned on Saturday, September 16th to face team USA after a 7 year hiatus in the NBC-10 Newport International Polo Series, presented by BMW. Representing the Dominican Republic in the #1 position was Mauricio Bogaert. Playing #2 was Pedro Cabrera. In the #3 position was Rodolfo Paliza, and at back was Alexander Schad. Defending for USA in the #1 position was Peter Friedman. At #2 was Heather Souto. In the #3 position was Dan Keating, and at back was Rory Torrey. 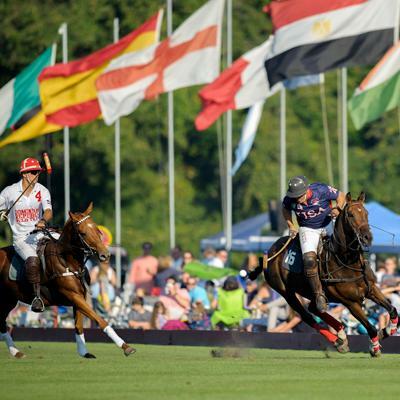 The evenly matched teams tightly defended each play through the first chukker, sweeping the ball clear just in time to stop its opponents goals. Finally, a line infringement by the Dominican Republic gave USA an open shot on goal, deftly converted by Torrey for a 1-0 USA lead. Two costly penalties to start the second chukker gave USA a leg up, adding two more goals thanks to Souto's steady and accurate swing. Schad took one back for the Dominican Republic, scoring the first goal for either side during regulation play. but another penalty converted by Souto for USA ended the chukker 4-1. Bogaert initiated the Dominican Team's advance immediately in the third chukker, earning the team's second goal, followed by another from Schad. Torrey had the last word with a goal for USA, ending the first half 5-3. Renewed defense saw the two teams cancel each other out through the fourth chukker, ending with USA still in the lead, 5-3. USA renewed its resolve to reclaim the Liberty Bowl, with goals by Souto and Friedman widening the gap to a 7-3 lead for USA. Torrey continued USA's advance in the final chukker, scoring one goal, followed by another from Friedman. With six goals in it, the Dominican Republic had a tall order to fill if the team was to run out the winners. Schad and Paliza let two goals fly, reducing USA to a 4 goal lead. As the final bell sounded, USA soundly defeated the Dominican Republic, 9-5. During the match, a lucky lady from RI won a magnum of Veuve Clicquot Champagne in the weekly door prize drawing. Enthusiastic tailgaters brought their team spirit on Saturday, well-heeled in team gear with a gourmet picnic spread in their wake, winning the Best Tailgate picnic trunks and 12 pack from Stella Artois. Following the match, the teams took to the podium for the Veuve Clicquot Champagne Toast and Trophy Presentation, where Stacie Mills and Mary Waddington of Vanderbilt International Properties presented the victorious USA with the Liberty Bowl. The evening concluded with an Après Polo Carribean Pig Roast and Dominican Buffet for a gourmet dinner under the stars. During the team's second visit to Newport, they enjoyed many of the best attractions and highlights in the City by the Sea, including hospitality by Vanderbilt International Properties Ltd, team lodging sponsor; ROCKSTAR LIMO for ground transportation; Birds Eye View for the aerial tours; Newport Mansion tours; America's Cup Charters for a glorious sunset sail; Clarke Cooke House for a classic team dinner & dancing in the Skybar; Sightseeing courtesy of Scooter World; Tennis on the legendary grass courts of the International Tennis Hall of Fame; Paddle boarding with Island Surf and Sport; Newport International Boat Show; Tour of Newport's finest estates and landscapes with the Newport Arboretum; and much more.